The antagonism between the two has waned to almost nothing: they forage together on the grass and only very rarely does Honey give Phoebe a light peck. They’re both eating well and look pretty plump. Yesterday afternoon was magical: the ducks were resting in the shade on the west grassy lawn of the pond, and nobody was around. 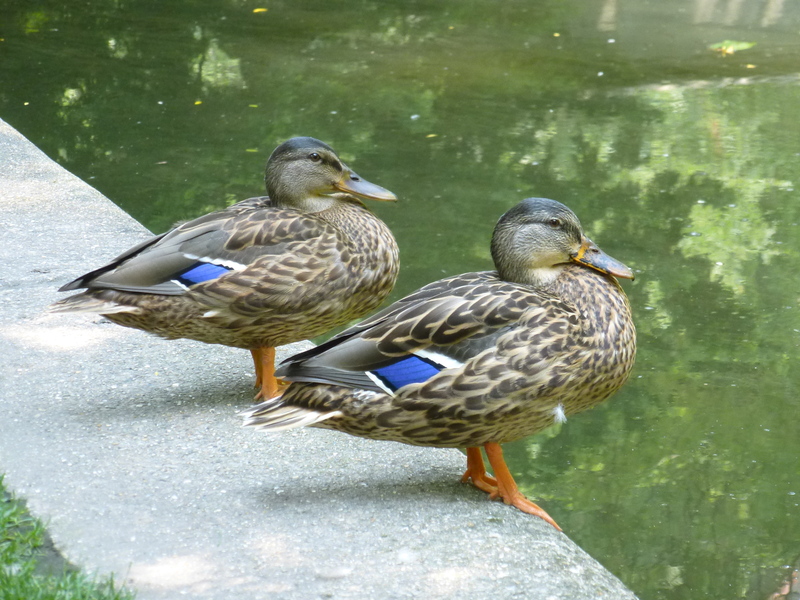 I fed them a lot of corn on the grass (my favorite way to feed them, as none is wasted by sinking in the water), and, after lunch, they sat together on the cement ledge at the edge of the pond. They know me and trust me, so I was able to sit only a few feet away from them, and for about 15 minutes we just communed, looking at each other and—I like to think—enjoying each other’s company. Then some kids came by, chased the ducks into the pond, and their dad gave them Cheez-Its to feed to the ducks. I said, “I don’t think it’s wise to feed them that stuff,” and the father said, “It’s only a few.” But Cheez-Its are not good for ducks, and they had already fled to the Duck Island, so the turtles got them. Perhaps next year I’ll ask the University to put up a “Do not feed the ducks” sign. I am going to Connecticut from Wednesday through Sunday, and I don’t know if they’ll still be here when I return, as Honey’s flight feathers are growing in rapidly. My hope is that Mom and Phoebe will fly away together so that Honey can show little Phoebe the ropes. Here are three photos from our Moment Together yesterday. I took a lot more photos and videos and will try to post them by Wednesday. First, the pair resting by the pond. Note that Honey (foreground) is growing in her wing feathers, and that mom and daughter are comfortable with each other. Phoebe has also grown! They both have lovely blue speculums. A down feather is hanging off Honey’s breast. 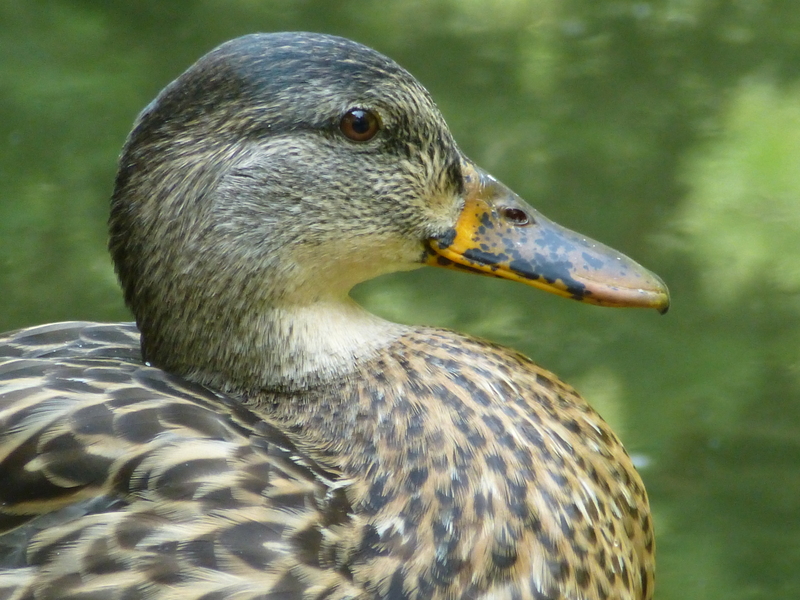 This entry was written by whyevolutionistrue and posted on August 13, 2018 at 7:30 am and filed under birds, ducklings, ducks, photography. Bookmark the permalink. Follow any comments here with the RSS feed for this post. Both comments and trackbacks are currently closed. At our park down the street there’s a sign that tells people to not feed the ducks bread (and I forget what else) because it’s harmful to them. People WILL feed the ducks regardless of rules, and the sign tells them what kind of food to offer. And there are vending machines that you stick a quarter in and get food that is good for both the ducks and the fish. If a “Don’t feed the ducks” sign went up, would it mean that YOU couldn’t feed the ducks and might get in trouble if you were caught? There must be a way to steer the public in the right direction and not stop conscientious duck lovers from feeding the ducks in the right way. 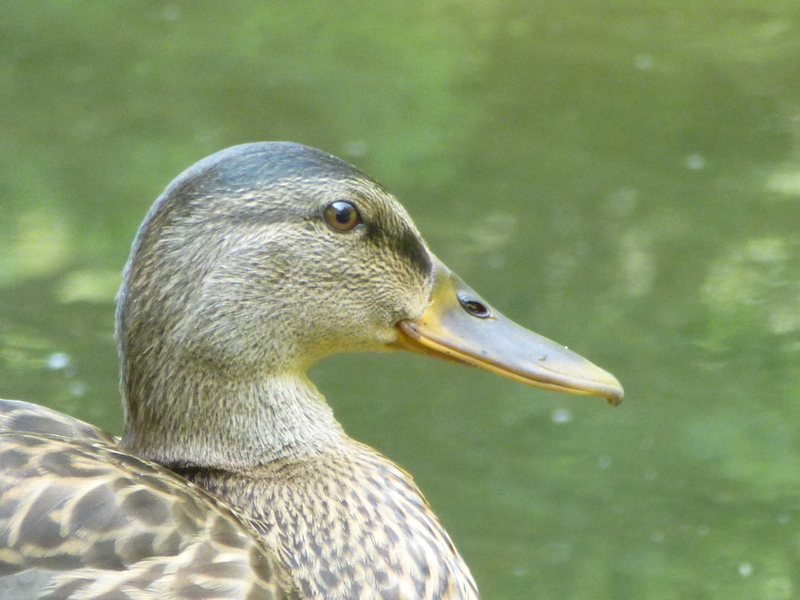 The University knows I feed the ducks and they like it, as the ducks are a draw to Botany Pond (they even put a picture of the whole brood on the University Instagram). I could simply ask them to put up a sign with the understanding that I would feed the ducks. We couldn’t have a food-vending machine; that wouldn’t fly. 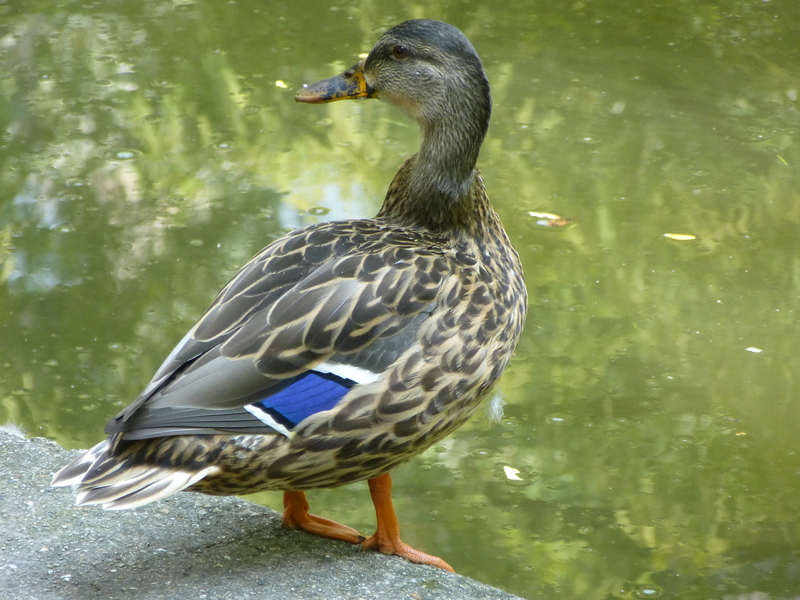 I haven’t really seen anybody feed stuff to the ducks that was good, so I’d prefer to be the Only Feeder. We have highly trained overqualified people for that task. “DO NOT FEED THE DUCKS UNLESS YOU HAVE A PHD IN BIOLOGY” would cover it. I believe the correct response, after the guy said, it’s only a few, would be – none would be better. This is such a heart-warming post…. thanks, Jerry. I think the gentle pecking is a reminder of the pecking order, to keep Phoebe in line. I wonder too if Honey pecks when Phoebe invades her personal space. I remember a doc on great nesting colonies of birds (was likely albatrosses) where the nests were meticulously spaced a minimal distance apart, otherwise the neighbours might peck each other’s chicks. Love the pics! It’s interesting how some of the markings on Honey’s upper bill seem to be carry on to the lower bill. Makes one wonder about the ontogeny of bills. I love the way their bills seem to turn upward at the corners, giving them the look of tentative, shy smiles.